As Helen mentioned, doing short rows in a sweater is no more difficult than doing short rows in a sock. However, you really should do them in the right location! On about row 7 of the short rows, I looked more closely at what I was doing and realized that, although the first two short rows were in the correct location, near the top of the sleeve, the rest were in the collar bone area of the sweater! Ah, yes -- "slip marker, k14..." If you're using more markers than the pattern calls for (and I always do), you have to make sure you're referring to the same marker! Can't we play more, lady? I decided to take advantage of this new-found kitty yarn love to show you the two skeins of Jojoland Harmony that I got in a trade with a friend. The yarn shades from a raspberry-rosy pink to green and back again. 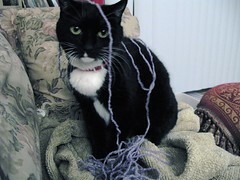 I realize this will sound like a travesty to some of you, but I traded her a pair of Addis for the yarn. I don't particularly like metal needles and Addis aren't pointy enough for me. My friend likes them a lot, though, but isn't a lace knitter. So now we're both happy! Meanwhile, Harley was performing "kitty ballet." Oh, those pictures of Dolly are SO CUTE! 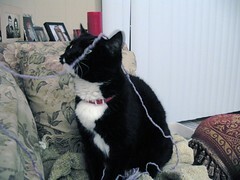 Dude, are you sure Dolly isn't licking that yarn instead of huffing? 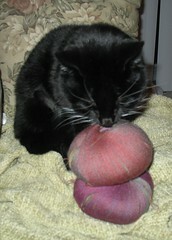 I swear I see a little pink tongue there--or is that the yarn??? 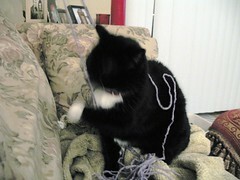 Regardless the yarn, and the kitties are quite sweet. Hee hee, sorry about the short rows. Ha! Felix and I were talking yesterday about Schuster doing "kitty ballet". Too funny! I can't believe how much Dolly resembles Charlotte. Her eyes are different - they more sort of limpid - but the texture of her fur looks really similar, and of course her coloring. I can't wait to meet her in June! Ahhhhh...short rows I've done a project or 2 with them myself! Good luck on Round 2. Gorgeous yarn! How are the temps these days??!! The kitty pics are so sweet. As much as I dig Addis, I don't think I could have resisted the JoJoland. I'm quite fond of the Harmony colorways and have 2 balls waiting to become socks. cute kitty!! She really sweet looking. I love the yarn. I agree with Michelle, I don't think I could have resisted that JoJoland. Good Choice.